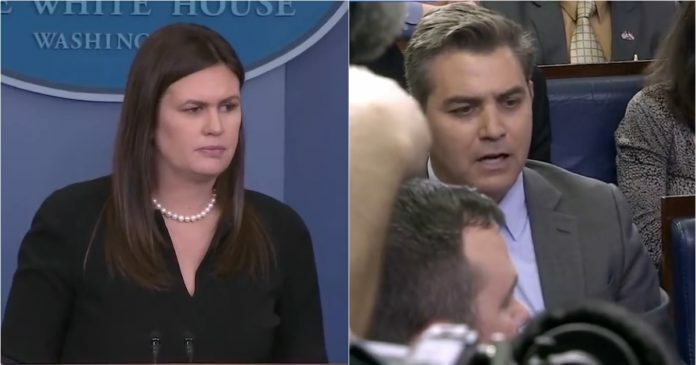 White House press secretary Sarah Huckabee Sanders and CNN hack job Jim Acosta wrangled during Thursday’s press briefing. Sanders tore into Acosta for constantly interrupting her and whining about petty problems. “I certainly would reject the idea that the president or this administration has halted freedom of the press,” Sanders said at the start of the exchange. Acosta adopted a fiery tone and threw out a question about Dr. Ronny Jackson, the Trump administration nominee for secretary of Veteran Affairs. “Yesterday, the president suggested that Dr. Jackson does not have the experience to run the Department of Veterans Affairs, is that a fair assessment?” Acosta asked. Acosta ignored Trump’s intent and focused on the words that suggested Jackson lacked experience. Acosta deliberately tried to stir up trouble for no reason. “If he didn’t think he had the experience, he wouldn’t have nominated him,” Sanders said of Jackson. Sanders argument was unanswerable, so Acosta switched tactics. “Since she brought up being taken out of context, it seems to be a press-related question, are you trying to say that this administration is a champion of a free press?” he asked. “And I think that those things should go hand and hand. And there’s a certain responsibility by the press to report accurate information,” Sanders shot back. Acosta’s combativeness doesn’t help anyone but himself. He might be feeding off the attention but CNN’s viewers aren’t being served. Sanders isn’t going to fall into the left’s trap. She won’t be baited into something silly.